To know the translatory kinematics of a body, we need to understand the following quantities. A frame of reference, Position vector, Rest and Motion, Distance and Displacement, Average velocity, Instantaneous velocity, Average speed, Instantaneous speed, Average acceleration and Instantaneous acceleration. (i) The frame of reference (Cartesian coordinate): It consists of three mutually perpendicular lines known as axis named x, y and z. The intersection of the axes is called origin. A particle is moving in the x-y plane at a particular moment of time, its coordinate is (5m, 3m), what is its position vector at that moment? (iii) Rest and motion:If position vector of a particle in a given reference frame does not change with time then it is said to be at rest with respect to that reference frame, and it is known as in motion with respect to the given reference frame. The state of rest and motion depends on the frame of reference. Example 1: Two friends are sitting in a moving car, with respect to each other they are at rest, whereas, with respect to a stationary person outside the car both are in motion. (iv) Distance: Distance is the total length of the actual path travelled by the particle. (v) Displacement: Displacement of a particle is the shortest distance between, its initial and final position and directed from initial position to final position. In other words, it is the change in position vector of a particle. In fig. 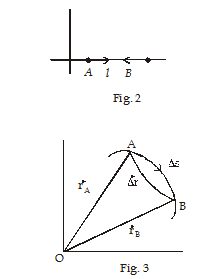 2, a particle first moves from point A to point B along the x-axis and then return back to the point A. The points A and B are separated by a distance ‘l’. In the entire journey distance moved by the particle is 2l whereas its displacement is zero. A particle is located on the y-axis on the positive side at a point A whose distance from the origin is equal to 2m. First, it moves along the positive y-axis to a point B whose distance from the origin is 6m, then it moves along the negative y-axis to a point C which lies on the negative side of the y-axis. The point C is 20 m away from the origin. Find the displacement and distance of the particle from above information. To calculate the distance, observed the particle in motion. It moves from A to B, B to A, A to O and O to C.